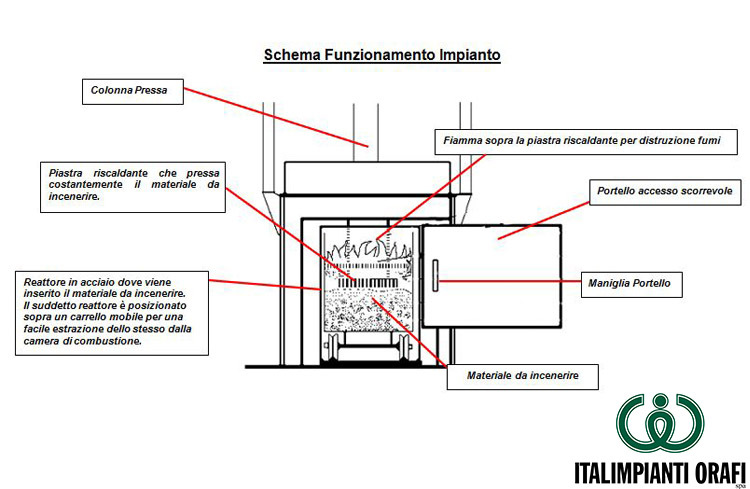 This plant has been conceived with a technology essentially based on the process of a controlled pyrolysis of the organic components with a subsequent thermal destruction of the latter into gas and contemporary calcination of the inorganic waste. This plant is in conformity with environmental regulations pollution, completing respecting emission allowances. Residual ashes are absolutely inactive because the calcination of the material eliminates all organic parts; this assures a nearly complete recovery of the metal. Note: The elimination of organic parts involves the absence of carbonaceous residues; such residues can be the cause of loss of precious material during the following melting phase. It directly guarantees the passage of the fumes “in flame” and therefore at a constant temperature of over 1300 °C (flame temperature). Note: An important parameter kept in great consideration by designers of after burners is the contact percentage air to be purified-flame combustion that has to be the highest possible; assuring a permanence of the fumes at a determined temperature is not in fact enough to guarantee the correct destruction of the polluting substances; with this system thanks to the particular geometry of the chamber and the primary burner, this percentage of contact is elevated infact the polluting gases are not simply made to pass in the flame but they directly go to feed it.